If you're like many of our customers, you'll take 10 minutes to read a joke email a friend sent you or even longer to read one of those political emails that get you all fired up because it's advocating a position you either strongly agree with or strongly oppose. So, I don't want to hear any excuses for you skipping the answer to this week's Question. The answer is unusually long but that's just the way it is. It's an important Question and Answer, so sit back, relax and have fun reading it and, possibly, learning something new! If you're a Remote Technical Support customer, time is running out to easily switch over to our new software. Soon, we'll be discontinuing our old software so please log into us and have us install the new software. 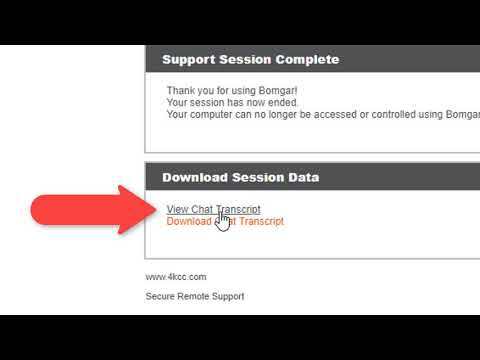 If you have our old software (4KCC Remote Support icon), you can log in and we will install the new software for you. We will also remove the old software. 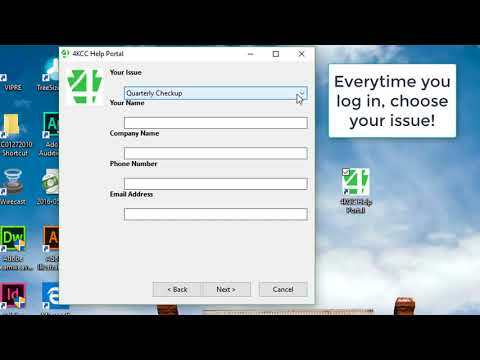 Double-click the icon labeled "4KCC Help Portal." When the software starts up, you will get a window with two choices. Do NOT click on "Enter a Session Key." Instead, click on "Describe your issue." When you do, another window appears. There's a drop-down menu at the top. Click and choose the reason you're logging in. We need you to choose a reason every time you log in. Then, type your name, phone number and email address. Finally, click "Next" and you'll be connected to us! Once connected, in most cases, you will need to click YES on the permission window which will appear. We have a video showing this and you can click on it below to see how it works. Question: "Why is my computer not as fast as it used to be?" Answer: Next to printer issues, "My computer is slow!" is our #1 complaint in Remote Technical Support. Let's see if we can break down this issue. The first thing we have to determine is whether a person actually means their computer is slow or do they mean their Internet is slow. There's a distinct difference between the two and the answer is different for both. Your computer speed might be fine when you're doing things like writing a letter or using Quicken but when you open a web browser, it's really slow going from page to page. This would be the situation of having slow Internet. If you suspect that your Internet speed isn't what it should be, you can visit www.speedtest.net and check the speed. (Note: this page is full of ads so don't click on anything except GO or TEST NOW.) This will test your Internet download and upload speed. Generally, the download speed should be at least twice as fast as the upload speed - usually it's three times as fast. If the upload speed is faster than the download, you have a definite problem. One of the problems when we perform speed tests is that a customer doesn't know which speed he or she is actually paying for. All of the Internet providers have various speed levels of service. You need to know which one you have so you can tell if something's wrong. Sometimes you can tell from your bill which speed you have but you may actually have to call to find out. What can you do if your Internet speed is slow? First, unplug the modem, if you have one, and leave the power disconnected for about 10 minutes. Then, plug the power back in and allow the modem to reboot (restart). This may take 5 minutes. Once the modem has completed the reboot process, try your speed test again. If you still have an issue, or if you're in a community where there's Wi-Fi and you don't have a modem, call your Internet provider. The provider can check the line and even check the modem remotely. Whatever you do, however, do not let your provider onto your computer. Call us and we'll handle that part, if needed. Inadequate RAM (memory). The amount of memory in your computing device might have been sufficient when you first purchased it but Operating System (OS) updates and additional programs may be consuming way more of the RAM leaving less for ordinary things like opening browsers and other programs. It might be possible to add more memory and resolve the slowness issue. There may be too many programs starting when the computer starts, again, consuming more RAM. You might be able to remove some programs from the start up without hurting the operation of the computer. You're not turning off your computing device at least once a week. (Yes, this applies to tablets and smartphones as well as computers.) Choose the same time of the week and turn your device off for at least 10 minutes - off, not reboot. Vents and processor cooling mounts are clogged with dirt and animal hair. This can cause the processor to run at a high temperature all the time, putting a lot of strain on the processor and slowing down your computer. Cleaning the vents and cooling fins may resolve this problem. If your computing device has a traditional hard drive (not a SSD Drive [Solid State Device]), it will naturally slow down over its life span. Hard drives have what is called "Read and Write Time." For instance, if you write a new document and save it to your computer's hard drive, the time it takes to save the document is called "Write Time." When you open a picture or document on your computer, the time it takes to open is called "Read Time." All HDD drives (traditional hard drives with a motor, as opposed to SSDs) slow down over a period of time. When this happens, the resolution is to replace the hard drive. However, if your computer is over three (3) years old, we recommend putting that money towards a new machine. Your computing device's hard drive is 90% full or more. Computing devices use something called "Swap Space" on the hard drive. When there's 10% or less of hard drive free space, the swap space gets smaller and smaller and your programs and processes run slower. If this is the case, replacing the hard drive with a larger drive will fix the issue. Again, though, if the computer is older than three years, we don't recommend sinking money into a new hard drive. Finally, your computing device's processor may not have been built for the current OS. For instance, if you are a Windows user and have a computer that originally had Windows 7 on it and you upgraded to Windows 10, the original processor wasn't built to run Windows 10 and it will naturally be slower. Remedy? Purchase a new computer. Figuring out why a computer is running slowly can be a drawn out, step-by-step process. If you think your computer is slow, feel free to log into us and we'll check it for you. If you're not already a RTS customer, come chat with us here: support.4kcc.com.